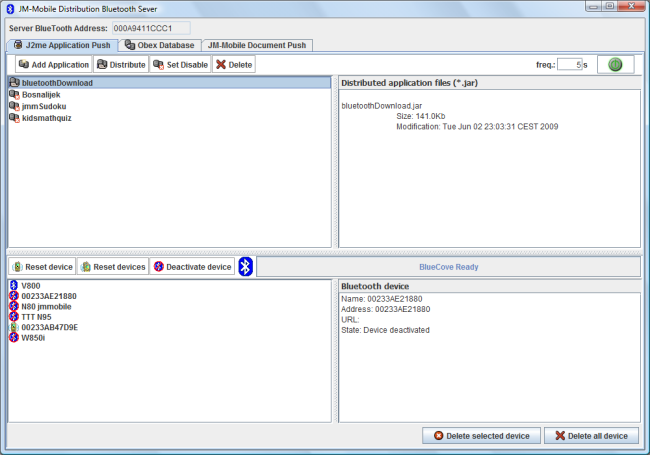 the Bluetooth server requires a java 1.5 or higher installed on your PC. extraction the BT server in a folder of which the path doesn't contain any space. a Bluetooth dongle must be plugged into the PC's USB port BEFORE you start the server. the server can't be tested by using the mobile simulators. the cell-phones used for testing must support btapi (jsr82), and must be installed the JM-Mobile Browser. Bluetooth Push server: that automatically detect the bluetooth cell-phones then send them the interactive content applications. That can be used to broadcast advertising/marketing messages to users within the (local) broadcast radius. Bluetooth media on demand server: with the Jm-mobile Editor we can create the applications to get the media from the jm-mobile buletooth server by using the get media by bluetooth action. See the bluetoothGetFile sample enclosed with the JM-Mobile editor for more detail. JM-Mobile document on demand server contains the Jmmobile documents that the jm-mobile browser can be download. The series number on the top-left of the server interface is the Bluetooth address of the server. This address depends on the Bluetooth dongle plugged in to your PC. Note this address and distribute it to the JM-Mobile applications that want to communicate with the server.